Just a few days ago, a rumor started to spread that Mark Ruffalo's Hulk will next appear in Thor: Ragnarok. Deadline has now confirmed that is true. The actor is currently in talks to reprise his role as scientist Bruce Banner in what is being called a cosmic road trip. He will be the secondary character behind Chris Hemsworth's Norse God. Taika Waititi is directing Thor: Ragnarok. The filmmaker is best known for comedy movies like What We Do in the Shadows and Eagle Vs. Shark. He is said to be injecting some humor into what has been described as one of Marvel's darkest scripts to date. Something called a Cosmic Road Trip certainly needs some levity. Christopher Yost is responsible for the screenplay. Another rumor that sprang up last week says that female character Valkyrie will have a prominent role in the story, though no casting has been announced. Suspected to return from previous movies are Tom Hiddleston as Loki and Jaimie Alexander as Lady Sif. 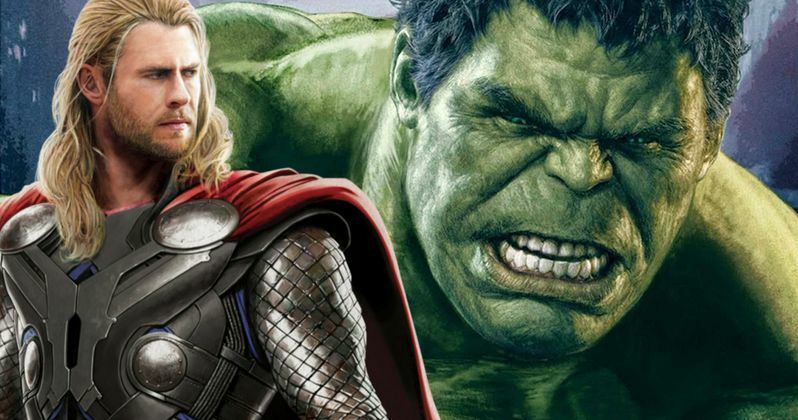 The filmmakers are said to to accentuate the humor between Hulk and Thor, which has been on display in 2012's The Avengers and this past summer's Avengers: Age of Ultron. The pair are the only substantial Marvel characters who are not showing up in next summer's Captain America: Civil War, which includes all of the other Avengers, along with Ant-Man, Spider-Man and Black Panther. The story will reportedly have Hulk and Thor encountering the Valkyries throughout their journey, and Marvel heroine named Valkyrie, a.k.a. Brunnhilde, may also show up. Valkyrie was first introduced in the Avengers comics, and she was also connected to The Defenders and Doctor Strange. Valkyrie's most notable enemy was The Enchantress, a character who may also be introduced on the big screen in Thor: Ragnarok. It's not yet clear if Valkyrie will be introduced as a stand alone hero, or if the Valkyries as a group will arrive as the beings who bring gods to Valhalla after they die. This latest move on Marvel's part has many wondering if and when Mark Ruffalo will ever get his own standalone Hulk adventure. While Planet Hulk has often been rumored, it's now believed that some of that story is being used for Thor: Ragnarok. The movie will have Thor and Hulk visiting a planet that is not Earth or Asgard. Having Hulk join Thor in this next sequel certainly makes the movie a must-see amongst Marvel fanatics and casual fans alike. Though, Chris Hemsworth's title character hasn't done too shabby on his own. 2013's Thor: The Dark World pulled in a worldwide gross of $644.8 million. And the original Thor, released in 2011, was a hit with a global take of $449.4 million. The move does fall in line with other movies in the MCU, which have often cross-pollinated its characters. What do you think? Are you excited to see Thor and Hulk teaming up for their own adventure? It will certainly be interesting.